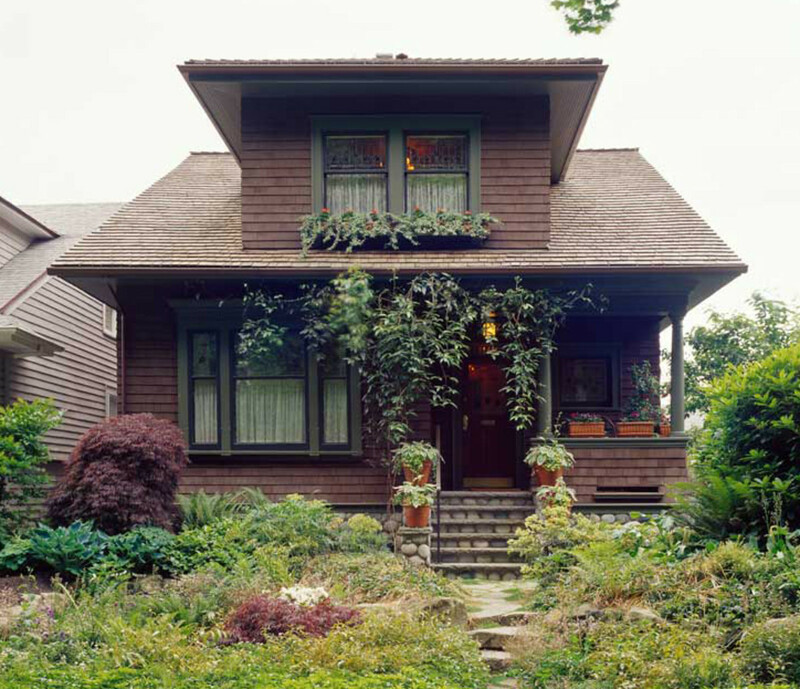 Shade-tolerant plantings added by the owners soften the simple house, which combines late Victorian and Craftsman styles. Bungalows were never meant to be big, which contributes much to their charm. Simplicity and scale is exactly what attracted Geoff Corso and Marshall McClintock to this basic but attractive house in Seattle’s historic Capitol Hill neighborhood. 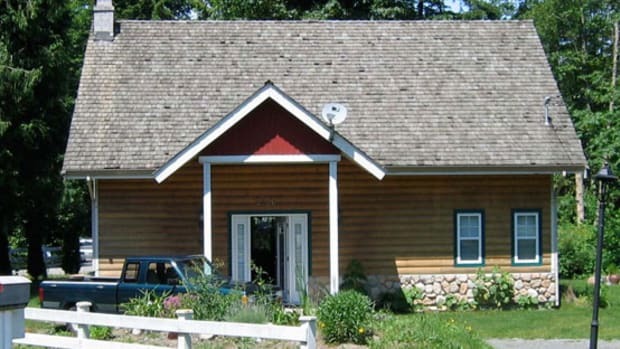 Another thing they appreciated was the bungalow’s place as a historic house type. Born and raised in Charleston, South Carolina, Marshall grew up with that long tradition of historic preservation so important in Southern cities like Charleston and Savannah. So he was happy to dig into research. 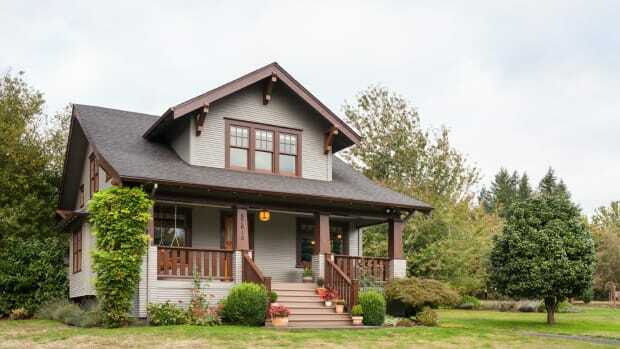 He learned that Seattle was a boom town at the turn of the 20th century; this house, built in 1901, was part of the development that followed extension of a trolley line along the neighborhood’s main avenue, which made it easier for people to live farther away from downtown. Typical of “spec” houses built in Seattle in the early 1900s, the house had elements of Victorian formality (including an entry hall and double parlors), but this was tempered by Shingle Style massing of its gables and dormers, and the curved sidewalls and recessed windows typical of the style. All rooms radiate from the dining room at the center of the house. Its decoration set the color scheme and themes for the home. After they moved in, Marshall and Geoff hit the books again before they began their restoration. 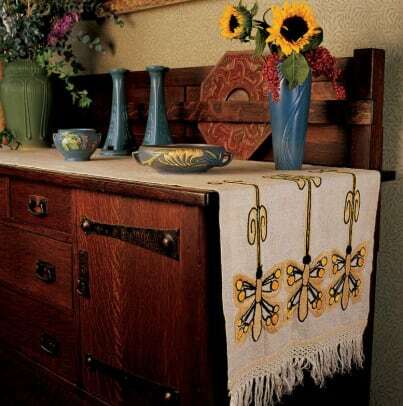 For more than two years they read everything they could find on the Arts & Crafts style of the period, falling in love with the rich, dark wood tones of the furniture and the simplicity of the patterns. They visited friends’ bungalows to get ideas. Then they began, adding a bathroom upstairs and removing a later bedroom wall to restore the space at the top of the stairs to its original use as a sunroom. 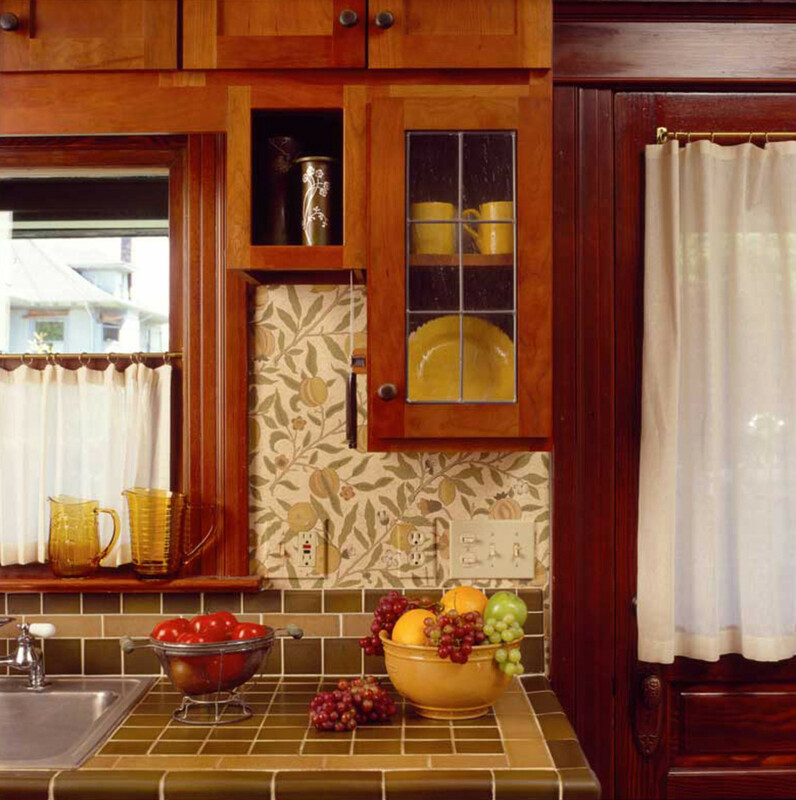 Earthy tiles, Morris wallpaper, and warm cabinets come together in a revival kitchen. 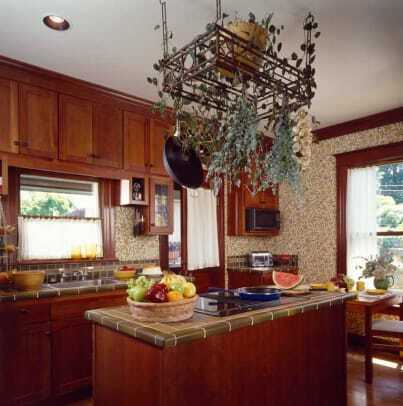 They put in a modern kitchen with seamless Arts & Crafts style. The pair incorporated into the exterior of the house some of their favorite local details, gleaned from long walks around the neighborhood. They added, for example, a course of irregular river rocks beneath the water table and a bowed apron of shingles. 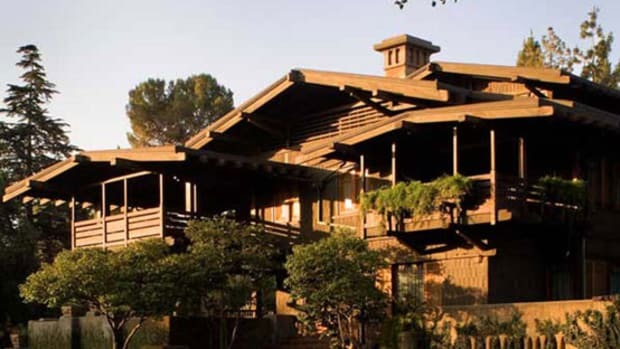 The exterior was treated to an Arts & Crafts scheme: fir-green trim and coffee-colored shingles. When they were eventually introduced to Seattle designer Laurie Taylor (who is now retired), Marshall and Geoff knew they had met a kindred soul. She has specialized in Arts & Crafts restorations. 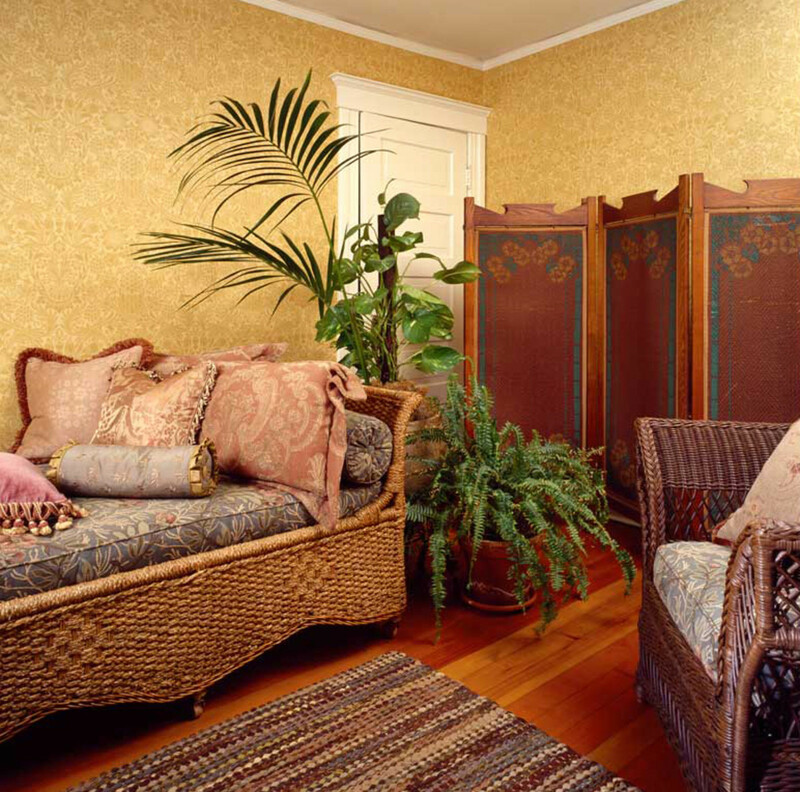 Laurie’s expertise helped them create a period-perfect interior that’s simple, warm, and comfortable. The center of the house, and of the interior design, is the dining room, which can be seen from every first-floor room. It became the focal point, setting the colors and style for the rest of the house. Bradbury & Bradbury’s ‘Fenway’ room set, featuring irises, cattails, and dragonflies, was chosen for its cheerful naturalism. The walls here are covered with Bradbury’s complementary ‘Willow’ pattern fill in a watery green. The team found a period chandelier in japanned copper to center the room, then had three sconces made to match the antique fixture. 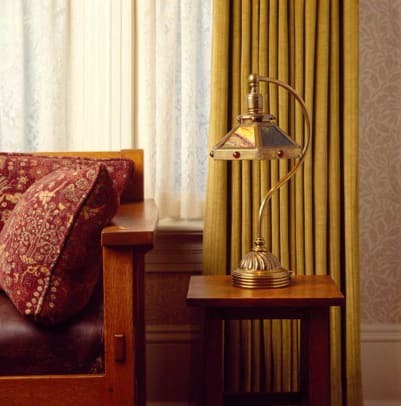 Curtains are elegant but unfussy in linen–velvet. 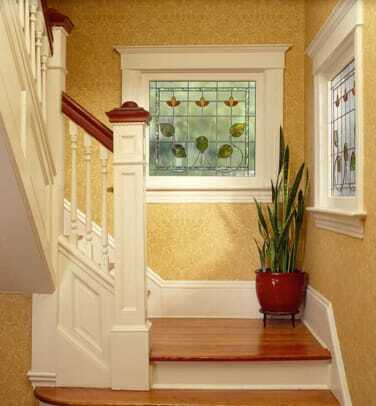 They soften the edges of windows, as the portières add softness and color in doorways to the hall and pantry. An antique sideboard and china cabinet by Stickley Brothers complete the room. Although unafraid of color, Laurie and her clients opted for pale neutrals in the dimly lit front parlor. 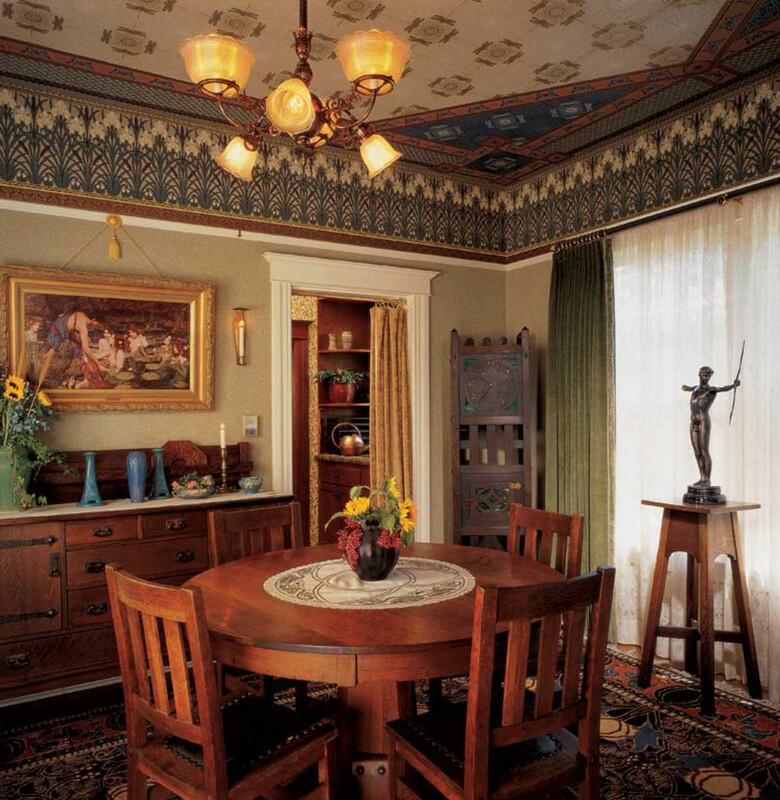 Morris-patterned papers on the ceiling and walls have beige and ivory tones. 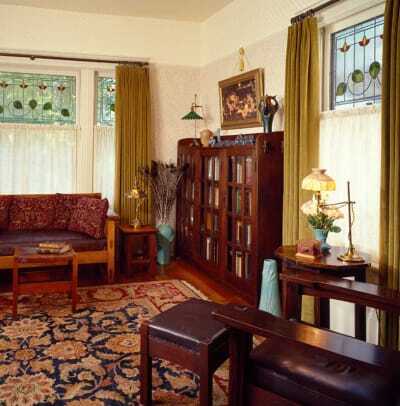 Stained-glass transoms in an Arts & Crafts motif add colorful accents. The pair found more Stickley furniture, including a triple-door bookcase and a paddle-arm Morris chair. Centered on a rattan daybed heaped with cushions upholstered in Arts & Crafts fabrics from Archive Edition Textiles, the new sunroom sits at the top of the stairs. 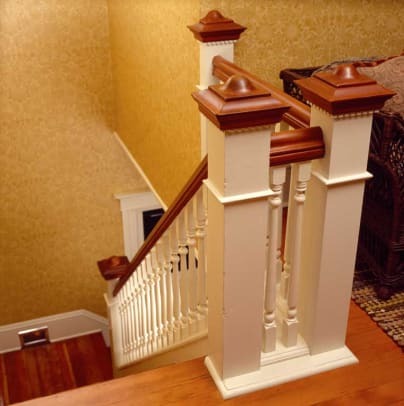 To re-create the sunroom at the top of the stairs (the space had been walled into a bedroom), the balustrade had to be rebuilt. The owners note that that project cost more than the house did in 1901—when it was built for $2,000!